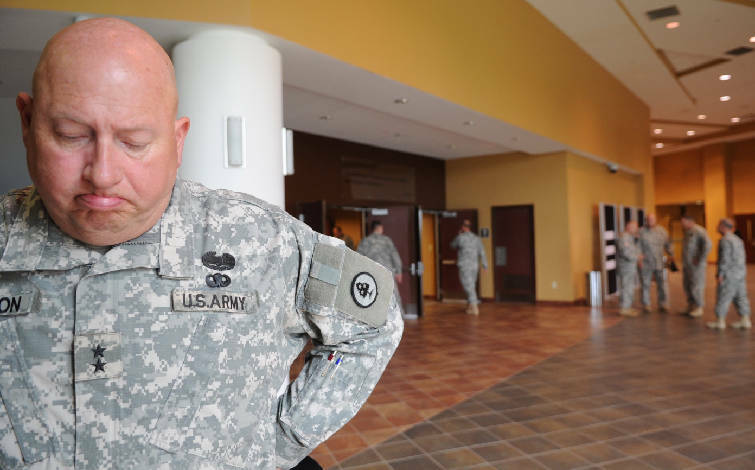 Maj. Gen. Max Haston, The Adjutant General for the Tennessee National Guard, gives an interview after a memorial service in honor of First Lt. Thomas Williams Jr. and Chief Warrant Officer 4 Daniel Cole in this 2011 file photo. NASHVILLE -- Tennessee Adjt. Gen. Max Haston announced today that Tennessee Army and Air National Guard members with valid state-issued gun carry permits will be allowed to carry weapons at state armories and facilities. The step comes more than two weeks after 24-year-old Mohommad Abdulazeez killed five U.S. servicemen in Chattanooga. Gov. Bill Haslam later directed Haston to come up with a plan in response to demands from many that National Guard members needed to be able to protect themselves from similar attacks. "We have been very deliberate in making the decision to arm our Tennessee National Guard," Haston in a news release. "This is not a step that we take lightly, but it is apparent that military personnel have been targeted and the protection of our Soldiers and Airmen is of utmost importance." He said "physical security and risk assessment is something that we continually do as part of our day to day obligations." Haston also announced that selected Guard personnel working on Federal facilities would be allowed to carry federally issued handguns. "Federal law prohibits carrying a personally owned weapon on a Federal facility," said Haston. "Therefore, selected personnel working on Federal property will draw and carry a federally issued firearm for protection." "Operational security prohibits me from detailing other measures taken to increase the protection of our personnel and facilities, but as I said before, the protection of our Soldiers, Airmen and their families is of the utmost importance and we are doing everything possible to insure their safety." Haston said.